Carmin Adams is an 11 year veteran and currently a third teacher at Belmont Central Elementary in Gaston County Schools right here in North Carolina. She is a graduate of Gaston County Schools and Belmont Abbey College! She is a proud mother of a beautiful sixteen year old and loves traveling! The main factor that influenced Carmin to become a teacher was the opportunity to interact with students and to impact them positively. Prior to teaching in the classroom, she served as a Computer Lab Specialist which provided the opportunity to work with all elementary grade levels, and assist in building technology based lessons for their curriculum. In addition to teaching over 350 students weekly on technology skills; Carmin collaborated and planned with all grade level teachers on how to incorporate and teach integrated technology lessons. She also served as Teacher Assistant of the Year during that time. She has served in several leadership positions, including: Benchmark Writing Team, Curriculum Revision Team for Elementary, MTSS Chair, Lead Teacher for 3rd Grade Summer Reading Program -Summer School, NCDPI Focus Teacher Group for Gaston County, Math Curriculum Revision Team, County Grading Practice Committee, Pinnacle Leader and also currently serves as a member of the Gaston County Teacher Induction Program for Success Committee. This committee serves teacher their first three years in the profession. Carmin is a highly motivated, outgoing and a creative individual who believes in accomplishing goals and objectives. She has learned to manage her time, work as a team and how to face new challenges. She believes in teaching others as well as learning with others. She believes if we give a child information, he may know it for a test. But if we teach a child the joy of learning, he will learn for life! She strives to empower students to take ownership over their learning! Quotables You have to be able to handle [feedback] Keep an open mind and adapt to change Teaching is complicated Empathize with your students Understand your role in your students' lives Say focused on why you started A mentor promotes growth to develop you as a teacher Carmin's Stamp of Approval Technology/Pinnacle Program Teacher Induction Program for Success [TIPS] Education Week- This Week in Education Connect with Carmin Email: caadams@gaston.k12.nc.us Facebook: https://ift.tt/2GvcbSZ Connect with Gretchen Email: gretchen@alwaysalesson.com Blog: Always A Lesson Facebook: Always A Lesson Twitter: @gschultek Instagram: Always.A.Lesson Linkedin: Gretchen Schultek Bridgers Google+: Gretchen Schultek Bridgers Book: Elementary EDUC 101: What They Didn't Teach You in College Leave a Rating and Review: https://ift.tt/2a7MyX4 Why? 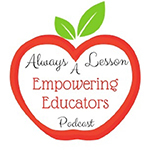 This helps my show remain active in order to continue to help other educators remain empowered in a career that has a long lasting effect on our future. How? Search for my show in iTunes or Stitcher. Click on ‘Ratings and Reviews.’ Under ‘Customer Reviews,’ click on “Write a Review.” Sign in with your iTunes or Stitcher log-in info Leave a Rating: Tap the greyed out stars (5 being the best) Leave a Review: Type in a Title and Description of your thoughts on my podcast Click ‘Send’ I love to hear from other educators! Please feel free to contact me through email: caadams@gaston.k12.nc.us. You can also reach me on Facebook under Carmin Adams.